Let Kids Make Their Loved Snacks ! It is my pleasure that I become Gordon business partner. High quality and competitive price make me more confidence to sale their products. Hi Jenny,I appreciate your fast replies always. You are so patient in every question I ask. Your product is also very good, my clients like very much! A very reliable supplier. We got quite satisfying response only by telling them our requirements of the order. In summer ice cream is kids’ favorite food! However, mothers are scared of commercially available ice cream pigment, gelatin, additive, they always can’t refuse when children say again and again: Mom, I want to eat ice cream. 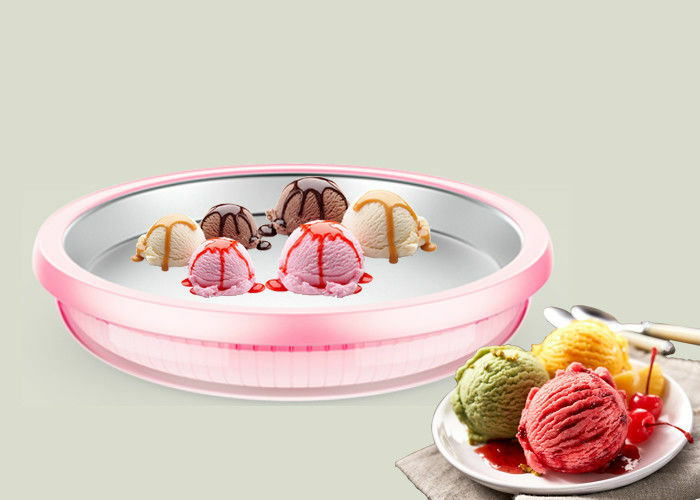 Fried ice cream maker, a magical food gadget without electricity, using the simplest physical heat conduction principle, it can maker juice, fruit, milk and other natural ingredients into delicious handmade ice cream, handmade yogurt tablets only for three minutes. The whole machine is made of food-grade materials and certified by Germany LFGB certification. -10℃ Ultralow freezing point coolant ensures that it can be formed in three minutes for first time, meanwhile the ice can last for 30 minutes. We can make 2-4 rounds of cold storage once, and the 9-inch ice cream maker can make 160ml of ice cream once to satisfy whole family. The integrated forming non-riveting folding edge fastening process used in the fried ice cream maker with -30℃ low temperature resistant silicone sealing ring can not only ensure that the cold storage liquid is not leaking but also can make the product durable. 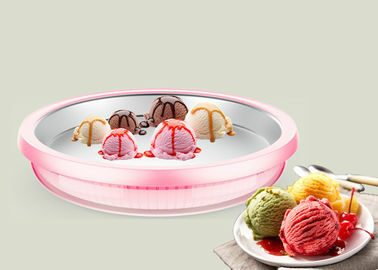 Meanwhile, our maker has 3 thoughtful designs: anti-freeze hand soft material edge ring, ice cream shovel with comfortable grip and a beautiful fruit bowl with dual use. Fried ice cream maker 3 minutes to enjoy handmade ice cream, this summer, kids are the master. Fast refrigeration, each serving just takes about 3 minute. -10 degrees Celsius ultra low freezing point cool storage liquid cooling as fast as lightning. TPE antifreeze edge ring, enable the children to hold it by themselves. First, prepare fresh fruits or vegetables, hand-blending the fruits/vegetable, milk. Pour the mixture over ice pan, evenly spread the mixture onto ice pan for about 30 seconds until it is firm. Then, add the desired dried fruit and ingredients or other sources and mix on well with the ice cream. At last, once firm and mixed well, scoop up the ice cream into a cup and enjoy. Put matcha (0.5g) into yogurt (100g) and stir well. Pour the stirred ingredients into the ice cream maker, sprinkle with red beans, raisins and coconuts. After 1 minute freeze, use ice shovel to scratch the grid. Shovel out and enjoy the delicious after freezing for 3 minutes. It’s better to place the bottom of ice cream maker upwards in the refrigerator. Fried ice cream maker should be frozen at -18℃ for more than 24 hours. The liquid ingredients pour over 160ml will prolong the production time. Using metal scoop will damage the protective film on the surface of the plate. Fried ice cream maker can be frozen once to make 2-4 rounds. Different temperatures, different times. Falling can be cause product deformation and may cause leakage. China Good Quality Manual Juice Maker Supplier. Copyright © 2018 - 2019 manualjuicemaker.com. All Rights Reserved.